Sometimes less is simply more! This entryway is just that. It may be a small nook, but it's big on design and function. I love the textures and nature-inspired colors in the decorative accessories. In terms of function, there's a landing spot for keys and small gadgets. You can also leave your bag on the shelf or under it. It also welcomes you to take off your shoes and leave them in the basket. Speaking of the basket, it brings an organic texture while serving double-duty as pretty storage. 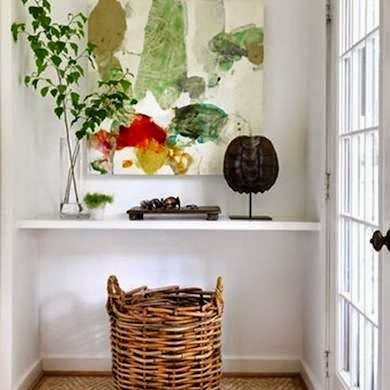 You don't need a formal foyer to carve out an entry like this in your home. Mount a shelf, place a few decorative and functional pieces, and voila... you have yourself a functional and beautiful entryway!